There will be a maximum of 7 bikes available on this tour. The machines used will be Suzuki DL650 V-Stroms (2014-models) which are gutsy, economical, comfortable for passengers and capable on dirt roads with the right tyres. As an upgrade we also offer the Triumph Tiger XCX and BMW F800GS, both a top-spec dual-purpose machines. There is also the BMW F700GS, ideal for smaller physiques. For further information on BIKES, and the terms and conditions of hire, please go HERE. As a participant in this tour you'll fly to Port Elizabeth in the Eastern Cape and be met by Blazing Trails staff. We will transfer to your guest house in Addo (around 40 minutes by road) where we will give you a briefing on the trip ahead. The following day we will hit the wonderful road. When riding there will be a lead rider and on-bike luggage will be provided. Tour participants will navigate using a 'marker' (also known as a 'buddy') system, whereby the rider behind the leader drops off and waits to guide those coming behind. 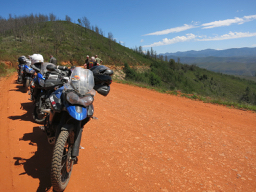 The riding on this tour is a mix of tarmac, graded dirt roads and some fantastic and remote trails. As far as is possible the tour has been designed to avoid major routes. 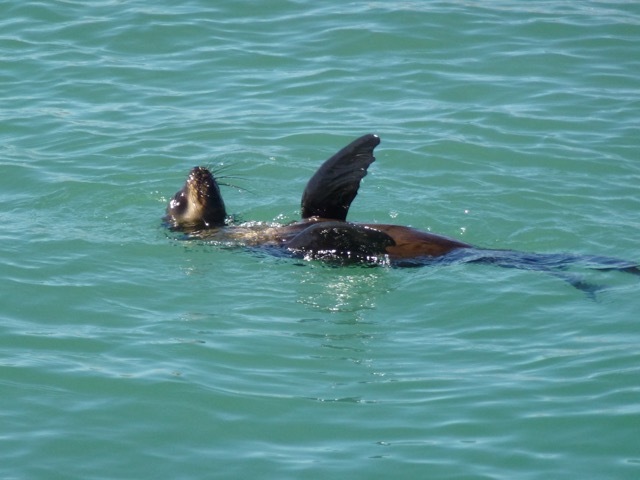 For more general information on South Africa, please see About South Africa. 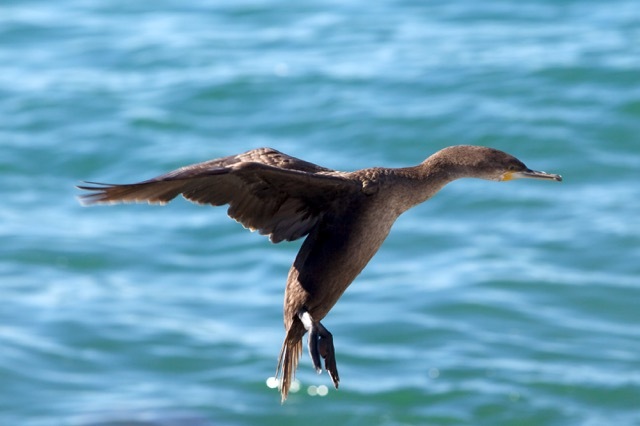 Fly overnight from the UK to JHB and on to Port Elizabeth Airport. Arrive at PE, where you will be met and transported (40 mins) to your overnight accommodation, where the Blazing Trails staff will brief you on the adventure ahead and introduce you to 'your' bike. Come early evening, we will gather for a 'braai' – a classic South African meal, cooked over an open fire. A super day of riding begins with a ride over Secret Pass, a steep climb through a private reserve brimming with game. The dirt track is a little challenging, but more than worth the effort. A regulation graded dirt road then takes us to Fort Beaufort from where we ace the twisites along the edge of the Great Fish River Reserve. We end the day on the Sunshine Coast. The journey to our next over-nighter will be mainly on the old Route 62 through the Langkloof, a beautiful, quiet, swooping road through farms and pastureland. The main event begins when we leave the 62 and head over the deliriously beautiful Prince Alfred's Pass. The day ends on the mountain's downside in a fun and characterful stop, with beer and great food. There's plenty more epic Cape riding as we head back to the coast, for lunch at the fashionable beauty spot of Knysna. And again when we pick up the Seven Passes route, for a mix of tar and gravel to George and then on to Mossel Bay, where we will enjoy an evening meal overlooking the ocean. There is plenty to do in and around this small coastal town. 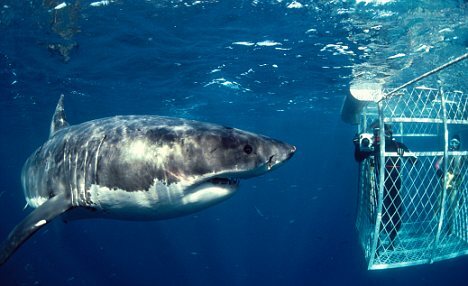 Popular options include cage diving with great white sharks (conditions permitting) and coastal walks. Less adventurous types might like to visit the interesting museum, or hang out in the numerous bars and restaurants instead. 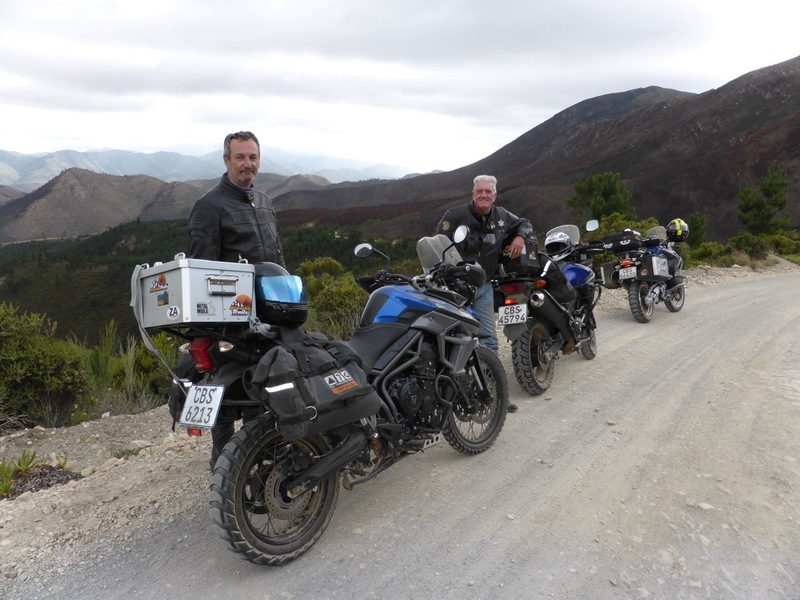 Following a mix of highway and lesser rural roads, both tarred and gravel, we will head for the southern tip of Africa. There should be the opportunity to view local wildlife as we go, with blue cranes and sacred ibis among the avifauna; springbok and blessbok representing the four-legged beasties. 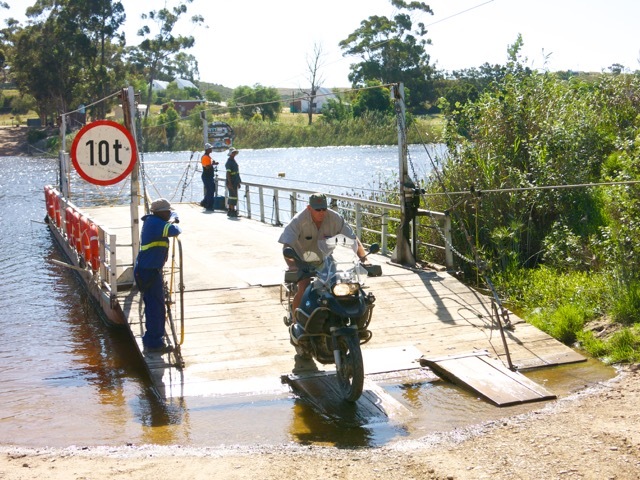 We will cross the Breede River on the famous hand-pulled ferry at Malgas, before a visit to Agulhas Lighthouse and the point where the Indian and Atlantic oceans meet. 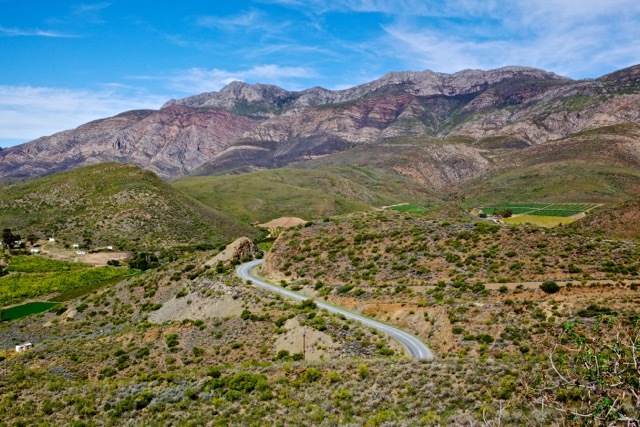 After a hearty breakfast we'll be off heading for the mountains and the spectacular Tradouw Pass, which carries us over the mountain ridge that seperates the Klein Karoo Desert from the coastal Cape. 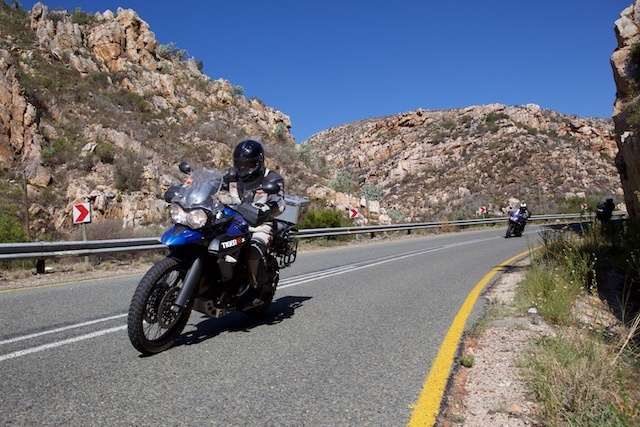 From Barrydale we will follow a riding classic – Route 62. This road is a combination of straight scrub-desert cruise and pass-climbing nadgery, as it carries us swiftly through the open spaces, past ostrich farms and timeless colonial villages. We will overnight in the town of Oudtshoorn, among the ostriches and desert landscapes. We turn west, towards the coast and pass of the day, the Outeniqua, a tarred snake heading down to the coast. 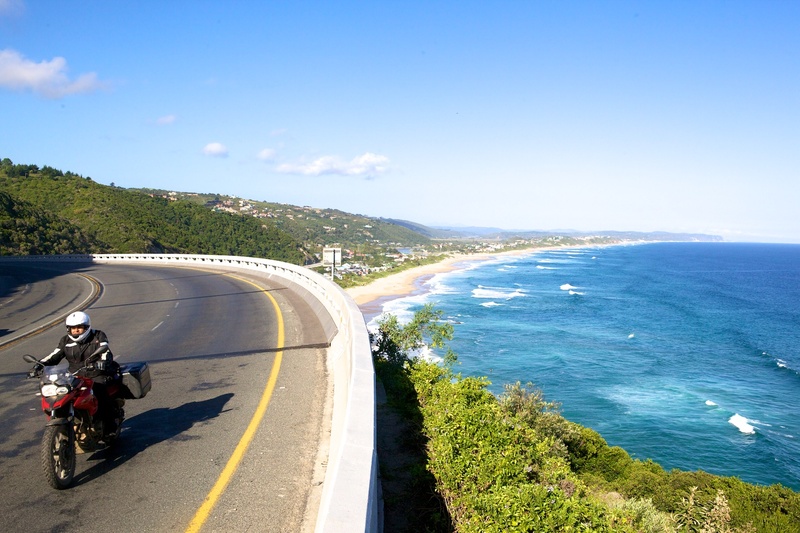 Next, we ride the whole of the Garden Route (some 400km, sticking mainly to the old road, not the main highway). We will take in beautiful coastal views before turning inland, back to our funky backpackers among the lemon groves of Addo. We have the whole day in which to explore the National Park. 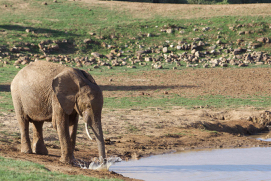 Elephant, kudu, warthog, eland, jackal and zebra-sightings are near-certainties. 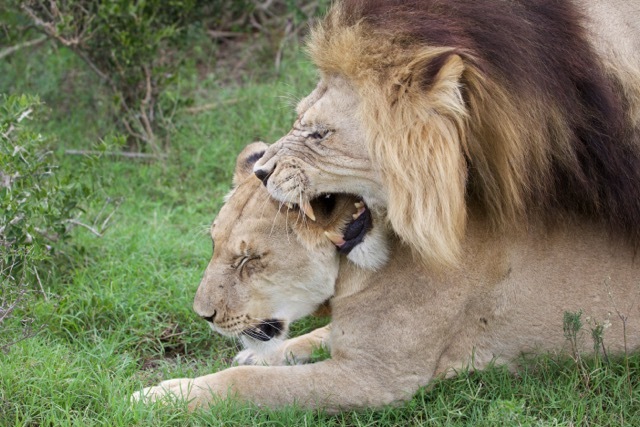 Observations of Cape buffalo, spotted hyena, back rhino and lion are also possible. The Addo flightless dung beetle occurs nowhere else! You are leaving today, so will be transported to the airport for the flight home. Goodbye and keep your chin up as you face the expectation of a cold country, with crowded roads, expensive booze and steaks the size of tupenny bits. E-tickets will be emailed a month prior to flying. You will need a passport and appropriate travel insurance. Currently UK citizens (and those from many countries) will be granted a tourist visa upon arrival. It is, however, your responsibility to check that you can legally enter the country. Most 'western' driving licences are also valid, but please also check your status before travelling. You should be able to get by on around £350 spending money if you don't do a lot of shopping. Cash and travellers' cheques can be changed at the airport and in the larger towns. Cash points are widespread and most vendors accept credit/debit cards. Cash is best for fuel stations as it speeds up what can otherwise be a lengthy process. Depending on what bike you choose and how you ride it, expect to part with aound £50 for fuel. At the time of year we will be visiting, South Africa should be nice and sunny, but not too hot, even at the coast. Obviously, though, we can't guarantee this and you should be prepared for the possibility of a couple of wet days. If it does rain in the mountains it can be a bit chilly, but not really cold. The maximum temperature is likely to be around 30ºC on the coast; the minimum 8ºC (at night in the mountains, if it has been overcast during the day). On the coast, especially at The Cape, it can be pretty windy. We advise riders to consider their kit in terms of layers, so you can adjust to be comfortable during the course of a varied day. Clothing as you would wear on a tour of Europe is perfectly suitable, whether leathers, or textiles. Heavy boots are advised. Some kind of waterproofing is a very good idea. Good gear can prevent a minor spill causing a trip-ruining injury, so we require that you ride with no exposed skin (except your face). Your luggage will be carried in panniers and top-box on the bike, though items not needed on certain legs of the trip can be stored at our base in Mossel Bay. Your main bag must be 'soft' and not a suitcase. You need not be any more fit on this tour than if you were riding in Europe. However, if you have any existing medical condition that may affect you during the tour, please consult your doctor and Blazing Trails before booking. 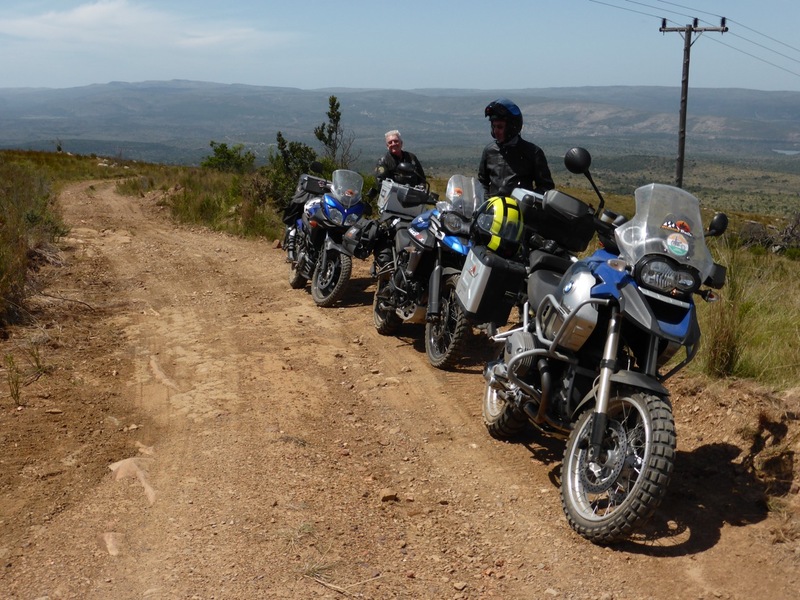 While we insist those joining us have a full motorcycle licence, and recommend a minimum of a year's riding experience, time in the saddle and miles ridden are of more relevance to an adventure like this. You must be happy to ride on gravel, conduct water crossings, etc., though we do not exceed 80kph on the dirt. There are some fairly long days in the saddle, up to a maximum of around 450km (280 miles) in a day. We do, though, try to design the tours so you get an easier day, or down day, after a long ride. South Africa is a very clean and hygienic country (we'd say more so than the UK), with clean ablutions in abundance, and safe tap-water, so the chances of getting even a 'holiday tummy' are low. South Africa has a very low incidence of Malaria - unheard of on this route), but we still recommend that you ask your physician for advice on inoculations. If you have any pre-existing medical condition, it is essential that you consult both Blazing Trails and your physician before booking. South African restaurant food will be familiar to those coming from the West. Food is of a high standard and is very good value (especially meat and seafood dishes), being around half the equivalent cost of the UK. One of the world's premier wine producers, South Africa is a great place to sample the grape, which is also good value for money. Decent beers (mainly lagers) are available everywhere. On our tours, food will only be inclusive where there is little or no choice, or where we have arranged something special (barbeques etc). For the number of meals included in the trip, see 'What The Tour Price Includes' (above). We have arranged the tour like this, so participants can explore for themselves. Not everybody wants to eat in a group every night, eat the same thing, or at the same time. We will, however, be happy to advise on eateries. As with eating, we do not want to prescribe what non-riding activities you chose to participate in. In many places there are several options, so we will be happy to advise, put you in touch with the right people and let you decide. While South Africa has had some pretty bad press in recent years for violent crime, very little of this nature happens in the tourist areas through which we will be travelling. And, as ever, the media tends to sensationalise the bad and ignore the good. Being guided through the 'right' areas in a group greatly mitigates the chances of encountering unpleasantness. Petty crime - pick-pocketing and theft - happens, as it does in virtually all tourist destinations with a wide gulf between rich and poor. A few simple precautions, like keeping your wallet/docs in an inside pocket and leaving nothing unattended on the bike, should mean a trouble-free tour. Unlike our Asian tours, we feel South Africa has developed enough emergency services and an efficient private health-care system (along with European standards of driving) to mean that we don't need to travel with a fully-qualified medic. Travel insurance, including medical cover, is compulsory on this trip. Great dirt/tarmac riding in a superb setting. Top value. Most of the riding is fairly easy going, with some great twisty passes. There are a lot of graded dirt roads and one short tougher trail. On the whole, this tour is good for pillions. Mainly smooth dirt and tarmac roads, but the ride is a bit of a challenge in places. This is a budget tour. All breakfasts and a couple of evening meals are included. If you're after fun, rather than four-star, this is for you. The food is cheap and good everywhere. 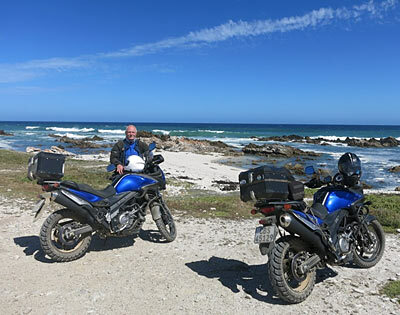 The Cape coast, Cape Agulhas (most southerly point in Africa), Tradouw Pass, Route 62, Robinson Pass, Outiniqua Pass, Baviaanskloof, Addo Elephant Reserve, Langkloof, Prince Alfred's Pass, Seven Passes route.